The BPMN notation is specifically targeted at the business modeling community and has a direct mapping to UML through BPMN Profiles integrated with the Enterprise Architect installer. Through use of these profiles, Enterprise Architect enables you to develop BPMN diagrams quickly and simply. The Enterprise Architect installer for releases later than 8.0 provides you with separate versions of the MDG Technology for BPMN that support BPMN versions 1.0, 1.1 and 2.0, and BPEL. 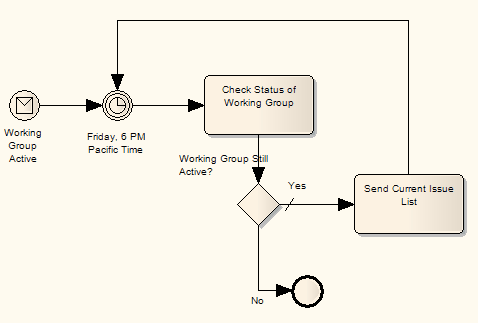 Specifications of BPMN elements and relationships are defined by Tagged Values (for example, to define the Message, Timer and Default Path (/) symbols in the diagram below). You can access the BPMN Toolbox pages through the View | Toolbox: More tools... option; select the BPMN 1.0, 1.1 or 2.0 options as appropriate. You can also set BPMN as the active default technology to access the Toolbox pages directly. If you prefer not to use BPMN in Enterprise Architect, you can disable it (and subsequently re-enable it) using the MDG Technologies dialog (Settings | MDG Technologies).